I finally took the time to set up a website, Facebook page and Twitter account for Judge Chiropractic, my father’s business. As you can see from the site, it’s pretty bare bones but does a nice job of covering the basics for a local business (services offered, hours of operation, address, contact information, and an about section for the business). If you search for “Judge Chiropractic” you’ll see that the site already shows up in the first page of the Google search results, ranking #8. I was pretty excited to see this as it has only been up for a week (perhaps that points to value of a domain that directly matches your search term). Equally interesting to see the Facebook page sitting two spots higher (#6) in the search results. 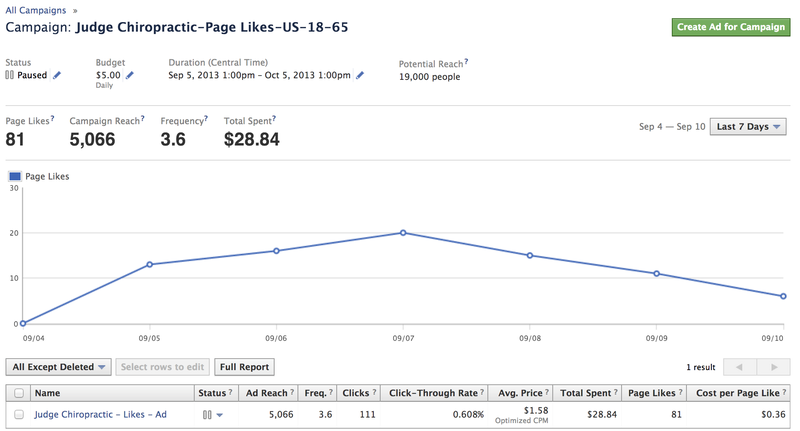 The ad generated 81 new fans for a total cost of $28.84, or $0.36 Cost per Page Like (CPL). This cost felt like a no brainer to me given the ability to target people I assume were already familiar with my father but not yet following his page on Facebook. He can now communicate with these folks at no additional cost, in a place where they’re already use to spending a lot of their day.